Don’t Lick the Minivan officially launches on Wednesday, May 22 so it’s a busy week. MEDIA: Tuesday, I’m on Calgary Breakfast Television at 7:12 AM and then on Alberta Noon’s call-in show on CBC Radio from 12:30-1:00 PM (unless the rumour about Edmonton’s mayor retiring pushes me out of that latter slot). Both segments are live which means you have the opportunity to watch/listen to me mess up in real time! TWITTER PARTY: On Wednesday, from 9-10 PM Eastern Time (7-8 PM Mountain), I’m throwing a book launch party on Twitter. 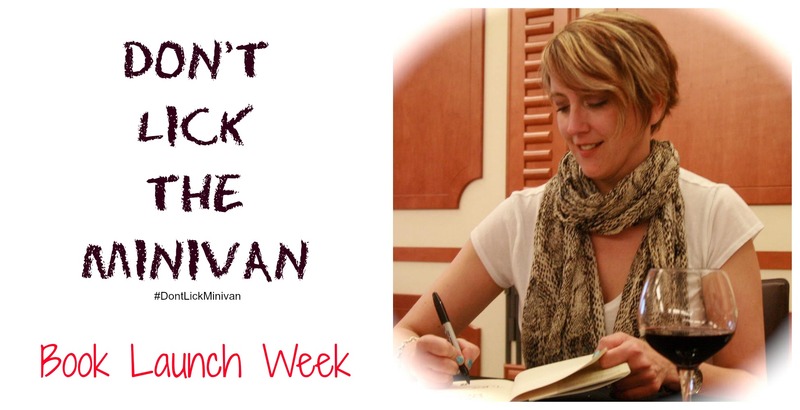 Join me under the hashtag #DontLickMinivan for six awesome giveaways. If you’ve never been to a Twitter party, it’s time to start. BLOG TOUR: I’m going to be getting around this week, IYWKIM. Look for me at Scary Mommy, Paige Kellerman, and Kelley’s Breakroom, to start. Links are coming. BOOK NEWS: Last weekend (May 12), I had an awesome traditional book launch party that over 100 people attended. I’ll post about that eventually. I hope to see you on Twitter on Wednesday, from 9-10 PM Eastern. I’d love it if some of my regular readers won prizes. Please spread the word! The best of luck to you on your book tour. Your words bring a smile to me! WHen do we get to do stuff for you, T? You go! Congrats on the week and the book. Have a blast and enjoy it to its fullest! Don’t forget you’re at my place tomorrow! I thought you were sleeping over tonight. No? Anyway, the bed is ready for you darling. IYKWIM. What station is “Calgary Breakfast Television”? I tried to find it once, but couldn’t. Citytv. Channel 8, I think, on Telus. Twitter parties – I must figure this out and join. 🙂 Congrats on the book release!! Congratulations, Leanne! Enjoy every minute of the chaos! I’ll be watching…if I can find it! Thanks! My mom and mother in law have already received the copies I preordered for them for Mother’s Day and are excited to get started! I will definitely be borrowing from the first one that gets done. Good luck with it all Leanne!!!!! It’s pretty bloody exciting!!! Congratulations! Best of luck with the launch! Leeanne, if you want to drop a book blog post on my site as part of your blog tour please let me know. The floor is yours! My wife loves your title by the way. I have been meaning to do a post about your book but life here has been crazy. I still have the pictures I stole from your site to kick on off though. Good Luck! I am so pumped for you Leanne! I’ll be at the twitter party and am happy to support in any way! Hope you and the fam are enjoying this big success! I have been pumped up about this for the past few months. Go Get Them Girl! SO freaking excited for you, mama. So happy to be in your sphere, reading your stuff and laughing out loud. P.S. Totally just pimped you out on my Facebook wall. Yep. S’how I roll. I am thrilled for you, Leanne. Hope I can amends with during and post launch promotion. The book is a treasure — one I plan to gift to many of my friends and family. Heck! I may even put a copy in my “library.” (No offense.) It makes much better reading than those horrid Bathroom Joke Books. No comparison. This is all too amazing for words. I just bought this as an e-book for my Ipad. Can’t wait to read it and to hear the rest of the pod cast on Michelle’s blog site. Congratulations! I loved this book and giggled out loud! Very exciting! Congrats. Twitter party – going to check that out! Congrats! 🙂 So happy for you! Congratulations. I am so very happy for you. My copy arrived the other day. Will be reading it as soon as I get home. Leanne Shirtliffe is everything I’m not: affiliated with an actual publisher, a regular on a version of Breakfast Television, a capable parent who knows how to spin her parenting mistakes into funny yarns and a good soul who has it all together. I came over here via The Hook. How thrilling! All the best to you. Congratulations! I hope you enjoy all the excitement around your accomplishment. I wish you all the best!!! This is so exciting!!! Lovely blog, I’m a new follower from Italy!! Congrats!! And best of luck with your book. 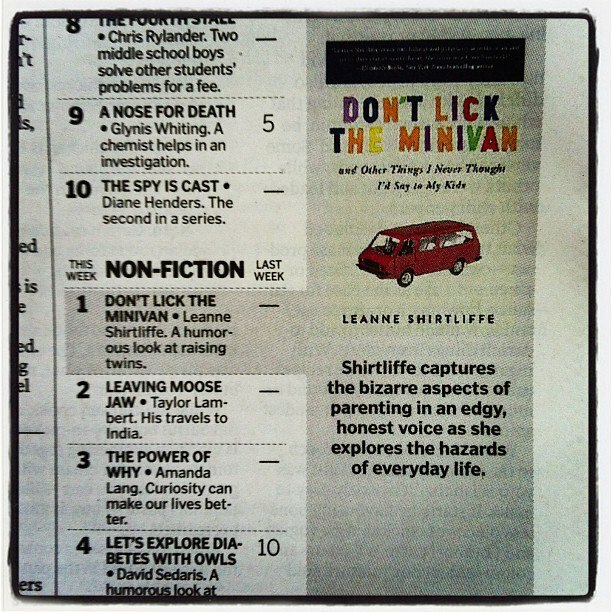 One of my favorite writers and funniest lady, I know, Leeanne Shrtliffe(Ironic Mom) has a book being published this week, “Don’t Lick The MiniVan”. How many out there have some children, raise your hands. Now those of you with hands in the air, how many of those kids can be the cutest thngs you’ve ever seen? Keep your hands up. And how many of you with your hands still in the air have kids that have done, or said some things that have you scratchin’ your heads thinking these kids can’t possibly be prodigy of mine! If so take a look at Leeanne’s book. She’s a fun read (I hope I can say that about her) and maybe, just maybe, she can remind you of some of your own stories with your own Minivan Lickers! Can you tell me, what did the minivan taste like? Wow, you’re really marketing with a bang! Not sure I’d have that confidence but I hope it goes really really well! Just got my preorder in the mail yesturday – very excited. Also excited to see you beat “Owls with Diabetes” and “Leaving MooseJaw” on the readers list – Thank God for small miracles! !